Without being unaware of the kind of sunny breezy day it is, wakefulness is submerged. I’m looking upwards at the day from shallow bleary waves. 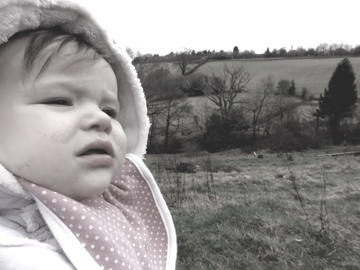 Baby is good company, and she sings at the trees thoughtfully when we walk round the fields. There are two babies in the house this afternoon, the littlest one drinks milk, farts like a machine gun, sleeps. Baby girl senior rolls in the dust, gets stuck under the table, sleeps. We are amused. Later, when I look out of the window, Cat is poised at the edge of a puddle dipping her head to drink. A robin watches from the scooped branch of an ash tree, indignant chest puffed. Cat will not be hurried.